I’ve got a mini nonfiction binge going. 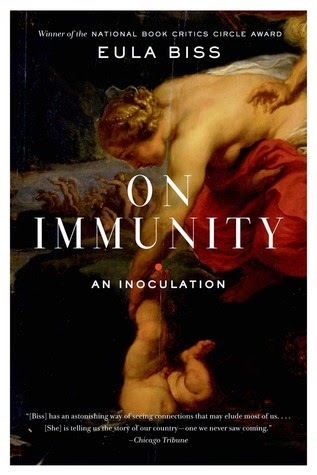 My latest read is On Immunity. An Inoculation by Eula Biss. I bought this book for my niece for Christmas because in the past we’ve shared an enthusiasm for Henrietta Lacks and The Emperor of All Maladies, and I was looking for something in the same vein. I read a blurb that made me think this exploration of vaccination would be along the same lines, but I didn’t have time to read it before giving it as a gift. I wanted to read it afterward though. With the current measles outbreak, it seems even more timely. This is a quick and easy read that shows both sides of the vaccination discussion, though coming down firmly on the pro-vaccination side. The essays are thoughtful and heartfelt, but I can’t say that anything in the book stuck with me the way Henrietta Lacks or Emperor of All Maladies did. It may be that it was a little too personal–relying a little too much on anecdote and musing to have the depth and heft I’d have liked. This was not the book I thought it would be–my fault, not the book’s–and so I was a bit disgruntled as I set forth reading what seemed to be a lot of theoretical discussion that wasn’t giving me a lot of "actual" information. I was hoping for something more straightforwardly encyclopedic (for research for my own historical novel writing): these foods were available here, during these time periods, prepared in this fashion, eaten like this. This is not that book. There are some sweeping generalizations about what was eaten, but that information was nothing new. The focus is mostly on the later Middle Ages. And the author concentrates largely on regions in Italy. He’s using medieval cookbooks from these times and regions to build his case. But, once I let go of what it was I wanted from a book about medieval food and read the book the author had actually written, I was able to appreciate that this is an interesting text. I particularly liked the central portion of the book where he talks about different categories of food: meat, fish, milk/cheese, bread, water, and wine and elaborates on the evolution of each in the diet–availability and symbolism. There is also a section on the fork versus eating with hands and a discussion of medieval manners. 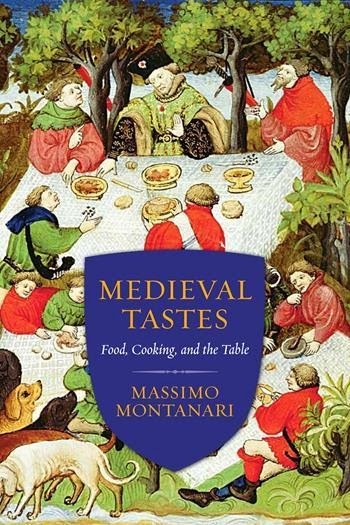 So, overall, this book is an interesting look at culinary history, or perhaps, historical food theory, but be aware going in that it is not a narrative history of medieval food. This is my second nonfiction book for the nonfiction challenge. I love Cecelia Holland’s writing. She’s one of my absolute favorite authors. So when I saw City of God offered on Netgalley, I jumped to request it. It’s a re-release of a novel from 1979, published as an ebook by Open Road Integrated Media. I’m thrilled to see that many of Holland’s books are being re-released as ebooks so I can get a hold of some of the ones I’ve missed. City of God is, as subtitled, A Novel of the Borgias, so the time period and subject matter are inherently fascinating. Holland approaches them obliquely using a fictional protagonist who both witnesses and influences history and in this way she makes a complicated political history accessible. She gives us someone else’s eye to view/judge the demon Borgias. Nicholas Dawson is the driven, brilliantly efficient secretary to the Florentine ambassador to Rome. He is not from Florence, but was brought up in Pamplona by monks after the death of his English parents. He has no real loyalty to Florence or Spain or any at all to England. Nevertheless, he is very good at his job and works hard to make his ineffectual boss look good, even though it generally means rewriting the ambassador’s dispatches into missives that are more politically astute. Times are changing. Pope Alexander’s son, Cesare Borgia, the Duke of Valentinois, is bent on conquering all of Italy and is making a reasonable go of it. He’s ruthless, without scruples, and has the support of the pope. Borgia wants Florence. He needs information and knows where to get it. He draws Dawson into his web. Dawson is not a particularly brave man, but he is ambitious. He is extremely intelligent and he likes to feel powerful. At least, he likes the illusion of power that he gets from proximity to power. Borgia frightens and attracts him. He is particularly excited when Borgia acts on counsel that he provides. Things become more dangerous and potentially more rewarding the higher he rises in Borgia’s circle. Dawson is, among other things, homosexual. Early on, he becomes involved with a handsome young man of lower social status–a thief and a gambler, who becomes somewhat of an unofficial protector. This relationship anchors and irritates Dawson as it moves beyond the sexual to more of a commitment and then into something that burdens them both. And yet, in the swirl of politics, warfare, murder, and betrayal that engulf Italy and occupy Dawson’s nimble mind, his love for Stefano (had he admitted it) may have been the only "real" thing he had. 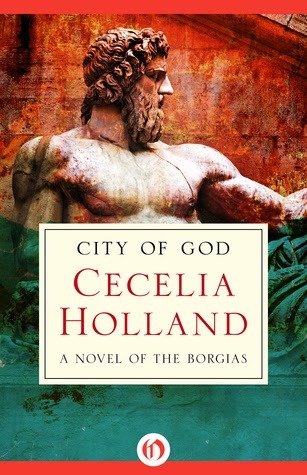 Holland does her usual superb job of setting a historical scene with just enough history and politics to immerse you in time and place without bogging down the action. Focus is on the characters. Dawson shines as a brutally self-interested man of the times who has to live with the consequences of his own actions. The characters in The City of God are not people to like or admire, but they populate a realistic and engrossing historical novel. 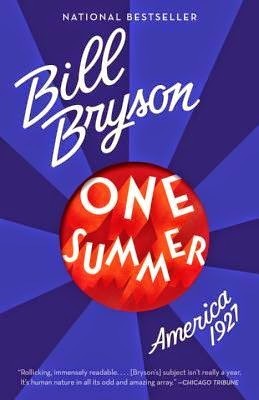 My historical fiction/history book group decided on Bill Bryson’s One Summer. America 1927 for this round. I was pleased for two reasons. One: I’ve never read anything by Bryson but have heard a lot of good things about his books and he’s been on my to-read list for a long time. And two: it’s a great way to kick off my non-fiction challenge. The book focuses on the summer of 1927 (as billed). And what a busy summer it was! Charles Lindbergh made his solo flight across the Atlantic. Babe Ruth set his home run record. Sacco and Vanzetti were executed for murder/robbery/being anarchists after widespread, worldwide protests. The Jazz Singer was released–heralding the feasibility and rise of talking films. And so much more. The book discusses Prohibition, politics, and gangsters. Sports and high finances. It touches on the headlines of the day–the appalling true crimes that riveted the country before being bumped off the front pages by the next exciting events. The book is a whirlwind. What keeps it from being more than just a catalogue of the daily papers from the summer of 1927 is that Bryson also travels back and forth in time to put the events in context. We are introduced to the backstory of some of these stories, and we learn a bit of what happens to the heroes after the summer plays out. Bryson does have an engaging style. This is a wonderful slice of American history and it does make for a great book club book because there are so many different sides of the story to tell. Have you read any of Bill Bryson’s books? Which do you recommend? One book down for the Back-to-the-Classics Challenge. I’ve read my choice for a children’s classic: Treasure Island by Robert Louis Stevenson. This is one of those children’s classics that somehow slipped by me, even when we were looking for books to read to my kids when they were young. And yet, it’s such a famous book–how can I have not read it? It’s a classic high seas adventure, full of nasty pirates, a few good men, a spunky, loyal boy, and a hunt for a buried treasure. In fact, it’s a bit surprising how many of the stereotypes of pirates and pirate adventures spring from this book. Even without ever having read it, I felt like I knew much of the story, since so much of it has entered common culture. Robert Louis Stevenson’s pirates are what we think of when we think of pirates. The plot itself is straightforward but fast-paced and exciting. 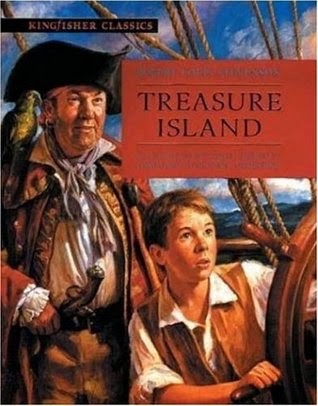 The boy, Jim Hawkins, gets a hold of a map indicating where a now-dead pirate has buried his treasure and, together with the local gentleman, Squire Trelawney, and the town physician, Dr. Livesey, he sets out for the island where untold wealth can be found. Unfortunately, the ship they have hired is manned largely by pirates, led by Long John Silver. Once they make it to the island, it’s a race to the treasure and a war between the two groups. The treachery of the pirates drives the action and Jim’s resourcefulness–sometimes inadvertent--saves the day. Narrated by Jim Hawkins, who recounts the adventure that happened to him in his youth, it’s an exciting story with all the immediacy of an eye-witness account, but some of the edge is taken off by the foreknowledge that the principal good guys have all survived. (The opening paragraph lets us know that Jim is urged to tell the story by his comrades, after the events.) At times, throughout the story, Jim will preface a harrowing adventure to come with a reassurance, such as: Then it was that there came into my head the first of the mad notions that contributed so much to save our lives. Although those little intrusions jarred a bit, I thought that maybe, for a children’s story, one as harrowing as this one, they might serve a purpose. It might not be a bad idea to remind a child that everything is going to be all right–just before launching a fictional child into a life and death situation. This is a fun tale, a quick one, and worthwhile. For anyone who sort of knows the story but has never actually read it–go ahead and give it a read!